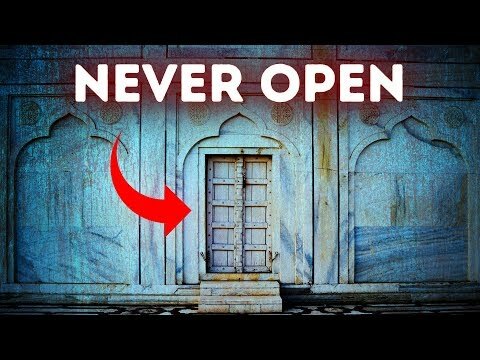 There are countless doors all over the world that haven’t been opened for decades and even centuries. The question is why? The truth is that some doors were sealed for a grave reason. And so far, nobody has found out what treasures and mysteries they hide. Here are 4 doors that keep their secrets all too well. – The Taj Mahal in India is one of the most romantic buildings in the world. Shah Jahan started its construction in 1631 to honor the memory of his third wife, whom he loved dearly. – Besides being a monument to eternal love, the Taj Mahal is also a very mysterious place. It hides numerous sealed rooms where no one is allowed to go. – The Great Sphinx of Giza is the largest monolith statue in the world. It’s 66 ft in height, 62 ft in width, and 240 ft in length. According to scientific estimates, this construction was built about 4,500 years ago! – With the help of a seismograph, researchers discovered 2 rectangular chambers at a depth of 25 ft. These rooms are situated underground, right under the Sphinx’s paws. – Sree Padmanabhaswamy Temple is a real pearl of the Indian state of Kerala. Underneath the temple, there are 6 vaults named A, B, C, D, E, and F. The doors leading to these chambers are massive and made of iron. – Many people believe that a fatal curse protects the door leading to this chamber. Hypothetically, this curse can be removed if a saint or sage chants a specific mantra in a proper way. – In central China, buried deep under a hill and surrounded by poisonous mercury, the First Emperor of China, Qin Shi Huang, has been lying undisturbed for more than 2,000 years. – Sima Qian, the Han dynasty historian, wrote in his “Records of the Grand Historian” that in Qin Shi Huang’s tomb, there were scenic towers and palaces for hundreds of officials. – Streams and rivers of liquid mercury surrounded Qin Shi Huang’s tomb. The biggest 2 represented the Yellow River and the Yangtze, the major rivers of China.